Some clarification of why this site takes the Historic or Classical Pre-Millennialist way of viewing and interpreting prophecy is needed. Please understand, I am not attacking any Christian or denomination in the following paragraphs--but I am challenging a particular method of interpreting Biblical prophecy, which many Christian denominations use for interpreting Bible prophecy. Also, when the word heresy is used in the following excerpt. Please understand, the word heresy is used to donate a way of interpreting Bible prophecy and not to label any Christian holding to such secondary beliefs. The following explanation which I excerpt from Chuck Misslers new two cassette tape series titled Thy Kingdom Come, Christs Millennial Reign explains the historic origin of the amillennialist way of interpreting prophecy. Chuck Missler paints this description with a wide brush and is looser with the historic facts and oversimplifies in ways that drives real historians crazy. But he presents the facts in understandable language and short order without writing a book on the subject, and that is why I use his description here of why I cannot promote the amillennialist view on this site in the very few sections this site has on prophecy. But first a couple observations Ive made on the subject myself. Some denominations fall into the category of being amillennialist in their eschatological interpretation (interpretation of prophecy). And some Christians and Christian denominations of the amillennialist persuasion also believe the book of Daniel was written around 139 BC by a number of Jews who were trying to influence Jewish thinking toward the coming Messiah--instead of properly attributing the writing of the book of Daniel to Daniel himself under the direct inspiration and guidance of God during the reign of Nebuchadnezzar, datable to 600-539 BC. In my opinion this belief is false and attacks the very innerency of the Word of God in the Old Testament canon--at least in the part of Gods Word that deals with prophecy. A person or church can have this interpretation while simultaneously trying to jump through every imaginable hoop in utilization of proper hermeneutic Biblical interpretation rules, and still be seriously off in their understanding of Bible prophecy. Most Protestant churches hold this amillennialist view because they inherited it from the medieval church they came out of in the Reformation, and not because they carefully researched this belief. So some historic research is needed to explain why this site will only promote the pre-millennialist interpretation of prophecy. But first let us address the question of properly dating the writing of the book of Daniel.  A footnote in Josephus for this passage says *The place shewed Alexander might be Dan vii. 6; vii. 3-8, 20,21,22; xi. 3; some or all of them very plain predictions of Alexanders conquests and successors. So if the book of Daniel was written in 139 BC as some suppose, how in the world did a high priest of the Jews present it to Alexander the Great in the 330s BC in the city of Jerusalem in the temple of God? Good question. Another big stumbling block to the amillennialist interpretation comes to mind. There are about 300 specific prophecies about the first coming of Jesus Christ, the Messiah, in the Old Testament. These prophecies were all literally fulfilled, each and every one of them. No allegorizing there. But in the Old Testament we find many of those prophecies of Jesus 1st coming are mixed right in with what are clearly known and recognized to be prophecies of Jesus Christs 2nd coming. How can one switch how he interprets these 2nd coming prophecies, allegorizing their literal meaning away, while all the while knowing that the 1st coming prophecies that are imbedded right within the same texts were literally fulfilled? That to me is a stretch beyond sound logic into the fantasy-land of myth. The first part of this three part series on the 2nd coming of Jesus Christ is a survey of all those Old Testament prophecies about the 2nd coming of Christ, and you will see all the prophecies for Jesus Christs 1st coming imbedded right within the same prophetic texts as those that apply to Jesus Christs 2nd coming, so youll be able to make this observation right on the spot. Dont take my word for it, read those prophecies for yourself in that first section, and then look them up in your own Bible and see what Im talking about--that the 1st coming prophecies were all literally fulfilled and were in no way meant to be allegorized into some different meaning, and so the 2nd coming prophecies contained in the same text also cannot be interpreted in any other way but literal--just cant be without breaking every rule of Bible interpretation and common sense. With that in mind, here are those excerpts from Chuck Misslers Thy Kingdom Come which will add some historic perspective of where Amillennialism came from, and thus why its a flawed way of interpreting Biblical eschatology. They are excerpted here to fill in vital background information on the Amillennialist view of prophecy and why this website does not subscribe to this view. What Id like to talk about a little bit is, Thy Kingdom Come. Weve heard that a lot, havent we. Isnt it in the Lords Prayer?--Thy Kingdom Come? What does that mean? It may shock you to realize that probably nine churches out of ten have no idea what that means. In fact, they deny the root doctrine that lies behind this. We see it says in Matthew 6:10 Thy kingdom come, thy will be done on earth as it is in heaven. What on earth does that mean? Were going to explore that a little bit. Nothing in heaven or earth is more certain. How is that prayed? Jesus taught us to pray that. How often has that been prayed over 1900 years? You know, in Luke 19 Jesus said that a certain nobleman went into a far country to receive a kingdom and to return. And he goes on with this parable. Whos the nobleman? Our Lord. Hes left, hes coming back, and to receive the kingdom. The return of Jesus Christ to rule on the planet earth, youll be shocked to learn how controversial that is. Many of us here probably take that for granted. There are 1,845 references to that in the Old Testament. Seventeen books give prominence to that very event. Three hundred and eighteen references in the New Testament, in two hundred and sixteen chapters. Twenty-three of the twenty-seven books in the New Testament give prominence to the return of Jesus Christ to rule on the planet earth. You would think that we could get it, wouldnt you? Youd think that wed understand that. Most of us realize there are three-hundred specific specifications that Christ fulfilled in his first coming, his first advent as they call it. For every one of those there are eight of them for his second coming. So its a big topic. Now tragically there was a very prominent church father by the name of Origen. He was very pious, popular, he was very persuasive. Hes one of the great figures of the third century church. He wrote many important documents, but he primarily presented Christian doctrine in Greek terms, in Hellenic terms. But the real tragedy is he introduced a theory of inspiration, or interpretation I should say, that allegorized the Scripture to extremes. And his writings influenced Augustine somewhat later. Now get the picture of Augustine. Augustine was that bishop of Hippo in North Africa from 354 to about 430 [AD]. Very, very influential guy, hes one of the most influential leaders of the western Church. He wrote The City of God which portrayed the church as a new civic order during the ruins of the Roman Empire. About this time, by 476 the Roman Empire is in pieces. So its already starting to fall apart. But get the picture. From, ah, 325 and following, the Roman Empire--Constantine made the Christian religion legal, big step. The second successor after him made it the state religion. Get the picture of a government funded pulpit where a pastor is preaching that Jesus is coming soon to rid the world of its evil rulers. That wasnt what you called politically correct. That was embarrassing. So they began to soften that by saying Well, hes gonna rule in our hearts. So literally dispossessing the earth of its usurpers and ruling became watered down and away. So although Augustines writings, many of them, defeated numerous heresies of the period, his allegorical reposturing of an Amillennial eschatology-eschatology is the study of the end times or last things. And Amillennialism is a term used by those who deny a literal Millennium, as such. Were gonna hit that head-on. And of course from Augustine you get Auchwitz. [this statement of Chucks put in context a little later.] You see, Origen allegorizes Scripture, Augustine institutionalizes that allegorization of the Scripture in what we call Amillennialism. And that led to a Medieval eschatology that the Reformation failed to restore. You know the Reformation under Martin Luther and the rest of them did an incredible job at what we call satireology--thats the study of salvation. They returned to the Scripture and recognized that salvation comes by faith alone. Many people willingly died being burned at the stake in their commitment to the authority of Scripture, in satireology. The great tragedy of the Reformation was they didnt go far enough. They accomplished great things in soteriology, but they ignored the eschatology. They continued to embrace an Amillennial eschatology that was their heritage from the Medieval church. And so, because of that, most Protestant denominations are Amillennial in their eschatology. And that also leads them to being post-tribulational in their views. Were gonna talk a little bit about that. What are the problems with Amillenialism? Well first of all, the Old Testament is replete with promises of a Messianic rule--the Messiah all through the Old Testament. In fact, it was so emphasized that when Jesus came in humility they didnt recognize him because they had their eyes fixed on one that was going to come in power and rule. The destiny of Israel is all wrapped up in this. The destiny of Israel and Gods Covenant is denied by most modern Christian churches tragically, because of this [Amillennial] heritage. To see why our Messianic Jewish brothers in Christ feel this way CLICK HERE. Now that weve probably offended all the amillennialists reading this, I wish to make one point perfectly clear that Chuck Missler briefly touched on. Martin Luther and all the other reformers got their soteriology (doctrinal knowledge of salvation) totally correct, so that means many members of their churches were born-again Christians. Even though their eschatology differed dramatically, they were still born-again Christians. That means that the 9 out of 10 Christian churches that Chuck Missler says are probably amillennialist in their eschatology can still be composed of born-again Christians. Interpretation of prophecy, called eschatology, is totally secondary when compared to the saving knowledge of Salvation through Jesus Christ alone. Those doctrines of soteriology [salvation] are primary to ones salvation. So whether a person is amillennialist or pre-millennialist in their prophetic interpretation of the Bible does not effect one bit their standing before Christ in matters of being born-again and salvation through Christ alone. I have merely attempted to point out some of the faulty logic of the amillennialist interpretation of prophecy and why this site cannot endorse it. But this site is mainly composed of quality Gospel of Christ oriented material having nothing to do with prophecy. The bulk of the material on this web site is quality gospel of Christ material for the nourishment of all denominations. I bear no ill will toward my amillennialist brothers in Christ or the denominations they come from. We are in agreement on some very important points. We both believe that Christs return will end the misery and suffering we experience on this earth. We both understand that the church is the instrument God is using to preach his message to the world today--a message of salvation through Christ--regardless how we interpret prophecy. Each of us has no doubt that ultimately eternity is what we long for when there will be no more death, pain, or suffering. We both believe that Christ has all power on heaven and on earth, and that it is only a matter of time before he comes back to set things straight. We both believe that Scripture sets before us Gods plan of redemption for his saints and his ultimate plan for the entire universe (though we disagree about specifics). Jesus is at the center of Gods work and the Holy Scriptures contain all that is sufficient for our salvation--regardless of our methods of interpreting prophecy. We need always to keep these things in mind as we deal with each other. 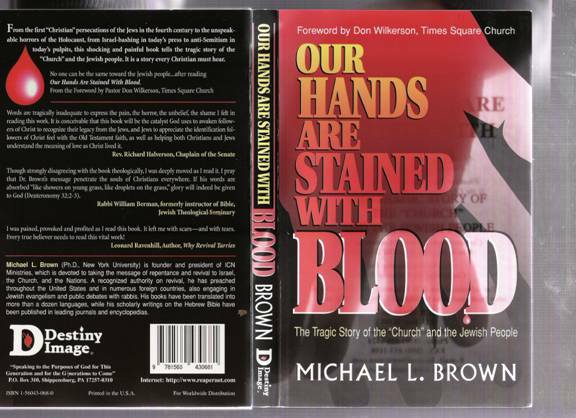 What follows is a book report, made from excerpts taken from Michael L. Brown's "Our Hands Are Stained With BLOOD". It is said of a good book, "I could not put it down." I must say of Our Hands Are Stained With Blood, "I wanted to put it down, set it aside, not read it or deal with its issues"-but I couldn't. The Lord would not let me put it down. I was too convicted. Convicted of my ignorance. Ignorance of the spirit of anti-Semitism that has been in the Church and in many so-called Christians throughout history. I did not know the extent of the persecution by Gentile "Christians" toward our Jewish brethren in the past. I know it now-thanks to Mike Brown's thorough research and indisputable historical facts. The statements of Christian leaders of the past toward the Jew left me shaken and awakened. What scares me is that a similar spirit of anti-Semitism is in the Church today among some segments of the Body of Christ. This has come in the form of a popular teaching circulating in the Church called "Replacement Theology," the idea that the Church is the new Israel, and that the Church alone is the fulfillment of the Old Testament prophecies regarding God's covenant with the Jewish people. If you have struggled with this question out of either ignorance or personal conviction, I challenge you to read chapters 12 and 13 of this book prayerfully. Mike's interpretation of the apostle Paul's teaching on who is Israel and who is a Jew is indisputable. To any sincere student of the Word these chapters will forever establish in your mind and heart that we Christians are not the new Jew or true Jew, that God has not and never will forsake His people, and that the possession of the Land by Israel is a right not granted by man but miraculously by God in perpetuity. This book is therefore a wake-up call to the Church. As a pastor I want anti-Semitism to stop at the church door. It must have no place among true Christians. Wherever we see this attitude raise its ugly head we must work to change it. And may intercessors be raised up to pray for the gospel to go "to the Jew first." I consider myself to be a lover of Israel and of the Jewish people. But there were blind spots in my vision toward the Jews. Mike Brown's message made me, I believe, better prepared to pray for and work toward the peace of Jerusalem. My prayer is that you will be as deeply moved as I was by this book, and that you will see that it gets into the hands of pastors, Christian leaders and laymen, as I plan to do-whether they are sensitive to Jewish issues or not. No one can be the same toward the Jewish people, both those who believe in Jesus and those who do not, after reading Our Hands Are Stained With Blood. This book needed to be written. Gentile believers need to know what was done to the Jewish people over the centuries in the name of Jesus. We Gentile believers need to understand the pain and suffering that countless pseudo-Christians have brought upon the Jewish people. Only then can we ever begin to comprehend the depth of the pain and sorrow they have endured at the hands of so-called "Christians". Although much of what you will read cannot be attributed to genuine Christian believers, some of it can. There is an unnerving trend toward a renewed anti-Semitic spirit, even among Christians, not only in the United States, but worldwide. We need to understand our responsibility "to stand in the gap" on behalf of God's still-chosen people. Genuine prayers of intercession need to be offered on the behalf of Israel. Heart prayers of repentance need to be offered on behalf of those genuine Christian brethren who have carried and still do carry such hate in their hearts. Resolve must be born deep in our spirits that will expose anti-Semitic attitudes both in ourselves and those around us. Finally, we need to be reminded to pray for the peace of Jerusalem, as the Scripture commands us to do, that the glory of the Lord might subdue the earth, and that at His coming, there would be a Bride made up of Jewish and Gentile believers alike, standing together in genuine unity and in the bonds of peace. ".It is the Christian Church-in name, though not in spirit-that has actually written much of Israel's unbearably painful history, using Jewish blood instead of ink. To this day, the name "Jesus Christ" is considered a swear word in many Jewish homes. The Savior's precious name has become profanity, tarnished by the evils done in His name by those who call themselves His people. It is time we Christians become aware of this shameful past so that there might be a glorious future-for Israel and the Church.."
From his birth, every Christian, practicing or nominal, imbibes the belief that the Jews, i.e., any and every individual Jew, are answerable for the murder of his messiah. Indeed, the overwhelming majority of the acts of persecution, religious coercion and massacres suffered in history by our People came at the hands of Christians. Thus we see that Christianity was a significant and major cause of Jewish suffering (Meir Simcha Sokolovsky). As you read some of the chapters that follow-especially as you realize that for many Jews, this "Christianity" was the only brand they ever saw-you will feel revulsion, shock and anger. No doubt your reaction will be, "But that's not the real Church! That's not me! True Christians are filled with love, not hate." On the one hand, that is absolutely true. The Church that butchered Jewish men, women and children could only be a thoroughly apostate Church. In order to emphasize that point, I have often put the words "Church" and "Christian" in quotation marks. Throughout the book, you will be reminded of that. .we must realize that both in the past and in the present, the erroneous theology of true Christians has helped open the door for all types of murderous persecutions of the Jews. The fact that some of this theology is still alive today is strong evidence that the contemporary Church needs to repent." ".Worse still-this is almost beyond comprehension-there are Christian leaders whose ministries are largely devoted to warning believers to beware of evil Israel. I am not exaggerating! There is still an ugly spirit in the Body that must be exposed. It is bad enough that the same diabolical spirit of anti-Semitism influences much of the world today. But that it still exists in the Church is unthinkable! Would to God that this generation of believers would finally drive out that foul spirit. This book has been written with a burning (and often broken) heart, in the hope that the people of God today would utterly repudiate the Church's sins of yesterday. This will bring reconciliation-reconciliation of the Church to the Jewish people, and reconciliation of the Jewish people to their Messiah. No doubt there will be controversy, from both Christian and Jewish perspectives. I only ask that you, the reader, read this book with an open heart before God. The results are in His hands. May your heart be stirred to action as you read the pages that follow! "You are about to go on a journey. The soldiers have ordered you aboard and the train is ready to leave. You stand side by side with your family, wondering what will come next. You are crowded into a railway cattle car, packed with dozens of other adults and children. Where are they taking us now?." ".The old, the sick, pregnant women and small children, two thousand innocent souls, were shot and brutally thrown into [freshly dug] graves, one on top of the other. Many of them were still alive! For most of the children they didn't even waste a bullet. They were just thrown in alive. And together with those who were only wounded, finished their lives under the pressure of the human mass.We learned of the massacre from the Polish police themselves. They told [our friend] Moshe Hersh about it in great detail, because they themselves had taken part in that slaughter. On the following Sunday, they went to church with their families, as if nothing had happened. They suffered no guilt feelings. After all, they were only murdering Jews, with the blessing of their priests, who inflamed them from their pulpits on Sundays" (Martin Rosenblum, quoted in Martin Gilbert, The Holocaust: A History of the Jews During the Second World War [New York: Henry Holt, 1985, p. 445, my emphasis] p. 177, Notes section of Our Hands Are Stained With BLOOD. "Christianity did not create the Holocaust; indeed Nazism was anti-Christian, but it made it possible. Without Christian antisemitism, the Holocaust would have been inconceivable.Hitler and the Nazis found in medieval Catholic anti-Jewish legislation a model for their own, and they read and reprinted Martin Luther's virulently antisemitic writings. It is instructive that the Holocaust was unleashed by the only major country in Europe having approximately equal numbers of Catholics and Protestants. Both traditions were saturated with Jew-hatred. [Dennis Prager and Joseph Telushkin, "Why the Jews? The Reason for Antisemitism (New York: Simon & Schuster, 1983), p. 104.]" ".The German Nazis, then, did not discard the past; they built upon it. They did not begin a development; they completed it. [Raul Hillberg, The Destruction of the European Jews.1985]"
"It is true that the Church has sinned terribly against the Jewish people. But not all the Church has sinned. Wherever Jesus has been lifted up and adored, there have always been genuine lovers of Israel. There has been a bloody river of Jew-hatred that has flowed through the history of the Church. But there has also been a stream of sacrificial love. It must overflow its banks in our day. Mercy and compassion must arise for the Lord's brothers and sisters in the flesh. How exhilarating it is when we walk in love." Learn about this stream of love and river of blood and who plays an active role within each. "There are hypocritical leaders in every religion. There are charlatans in every faith. But are the rabbis especially guilty? Are they worse than everyone else? Do they all conceal horrible sins in their hearts? Are they ungodly blasphemers, since they deny Jesus as Lord? Are they superficial legalists, since they reject the New Covenant?" The truth about the way most of the rabbis are and were in history will amaze and humble you. Are you ready for the truth? "What do you think of when you hear the words, "Mary, the mother of Jesus"? Do you think of a statue in a Catholic church somewhere, with the Son of God as a babe in His mother's lap? It certainly sounds "Christian," doesn't it? Now, what do you think when you hear the words, "Miriam, the mother of Yeshua"? Quite a different picture comes to mind! This one looks extremely Jewish. Well, for the record: The mother of Jesus was named Miriam as surely as the sister of Moses was named Miriam. In fact, all the Mary's in the New Testament were Jewish women called Miriam. (That's right, Mary Magdalene was actually Miriam of Magdala! If we had called her "Mary," she would not have known we were talking to her.) Because the New Testament was written in Greek, the names have come down to us in Greek dress. But, if we want to get our facts straight, we need to understand that John was really Jochanan (pronounced Yochanan), Matthew was really Mattityahu (Mattai for short) and good ol' Simon Peter was really Shimon Kepha. In fact, James was really not James at all. He was Jacob!." Do you really understand the culture the Christian church was born out of? If you're so not sure now, you need to read this chapter. Modern Messianic Jewish congregations may be carbon copies of the original Jerusalem Church of God. Does that shock you? "What do the major newspapers, news magazines and news broadcasts on television and radio all have in common? It is a history of misleading, anti-Israel reporting! Here are some examples. What follows in this chapter is a factual expose of reported stories and the actual truth that debunks each and every one. Do you have the courage to learn the truth and be set free from all the lies? Read the real plain truth about this bias as Chapter Six exposes and separates fact from fiction behind the sensational news stories of the mainstream press. Who are the real bigots? "Everyone has heard about the Spanish Inquisition. In the days of Christopher Columbus and of Ferdinand and Isabella of Spain, the Catholic Church launched a terrible persecution against suspected heretics. Thousands [of Jews] were imprisoned, tortured and burned at the stake. All this is common knowledge. But how many of us know that there was a particular "heresy" the Spanish Inquisition sought to uncover and destroy?" "Rather than taking the Law away from Israel, God promised to put it in their hearts. The New Covenant does not do away with God's Law [cf. Jeremiah 31:31-33; Hebrews 8:6-12]. Instead, it makes it relevant in a new and living way. This actually should be attractive to other Jews! Of course, observance of the Law does not make us more righteous, more loved or more spiritual. Through the cross our sins are forgiven, and the Spirit leads us in paths of life. But where is it written that believers, in particular Jewish believers, are forbidden to observe the Law? Where is it written that the Spirit always leads us away from and against the Law? Let's get more specific: Where do the Scriptures clearly and decisively make Sunday into the Sabbath? (Forget about Church tradition. What does the Bible say?) Then why are Jewish believers who set aside Saturday for Sabbath worship considered divisive? Where does the Word teach that Jews must become Gentiles to be saved? We have really forgotten our roots! "According to Romans 11:11, "salvation has come to the Gentiles to make Israel envious." When the Jewish people see that it is the Gentiles who have Israel's Messiah, the Gentiles who are enjoying the manifest presence of God, the Gentiles who are walking in the joy of the Lord, then Israel will become envious. But has the Church made Israel envious?" If you think so, then you need to read what follows in this chapter--what an Israeli writer has had to say on this subject. Also, why do Jewish believers insist on calling themselves Messianic Jews? "A little more than 100 years ago, a Christian minister to the Jews "was asked what he thought wanting on the part of the friends of Israel. He replied, 'More tears.'" Why more tears? What does he mean by this? Is Judaism evil and anti-God? Learn the plain truth on this matter. The facts revealed in this chapter will astound and humble you. "Some things are non-negotiable. God's covenant with Israel is one of them. How could He have made Himself more clear?" This is a question that needs answering once and for all from an honest and biblically accurate study of God's Word. This chapter provides a clear definitive answer from just such a study. "Romans is Paul's theological masterpiece. In the first eleven chapters, he lays out the absolute essentials of our faith. In the last five chapters, he tells us how to live. If we understand Romans, we understand the gospel. It is in Romans that Paul demonstrates that all have sinned, Jew and Gentile alike. It is here that he opens up the incredible revelation of justification by faith [the same identical faith Abraham was saved by]. (Think of trying to understand that without Romans!) It is here that he speaks of our struggle with sin, our victory over sin and life in the Spirit of God. And then he brings it all to a climax with an in-depth teaching about Israel.". A proper understanding of what Paul teaches about Israel in Romans clears up just which Israel Paul is teaching about in Romans-the natural children of God-the Jews-or the spiritual Children of God, the believers in Jesus. Have we been wrong in our understanding of just who Israel is when that name is mentioned in the New Testament and Romans in particular? "Here is where the Church, which has been primarily Gentile since the second century, has made a big mistake. She has been guilty of boasting over the natural branches, forgetting her root and misinterpreting Israel's hardening." ".We [Jewish believers in Jesus] are not as much the fourth branch of Judaism as we are the Jewish part of the Church! It is only together with the rest of the Body that we will be perfect.It has not been enough [for the Gentile church] to spiritually apply God's promises to Israel to their own lives. No! They have stolen Israel's promises.Paul saw clearly from the Old Testament, his only Bible, that God had a place for the Gentiles in the Body right beside His people Israel.He saw instead that the Church-Messiah's Body, the Congregation of God-consisted of all believers from [both] Israel and the nations [i.e. the Gentiles].But as people of God, let's be godly people. "Thou shalt not steal," He says. It is enough that the Church can embrace these glorious promises and partake in their nourishing sap. Why try to steal them entirely?.the Church has taken away God's promises to the Jews [not literally, but through their biblically inaccurate doctrines]." Want to see how this happened? "With every fiber of his depraved, sinister being, Satan despises the Jews. He hates them with a perfect hatred. Their total destruction is his goal. He is the author of the spirit of anti-Semitism. There is no other way to explain the venomous hostility that has been hurled against the Jews by so many people in so many countries for so many years. Why the Jews?.anti-Semitism existed before Christianity began. Jerusalem and the Jewish people were on the devil's hit list long before Jesus came into the world! (Read Ezra 4:12-16 and the book of Esther for some good examples [Also read Josephus, A History of the Jews]). You say, I know, that we have sinned, O Lord. It must surely be true! And therefore we are punished? I can understand that too! But I should like You to tell me whether there is any sin in the world deserving such a punishment as the punishment we have received! Anti-Semitism has clearly overstepped the bounds of heavenly judgment and chastisement. But why? Who's responsible? Is it God, as many assume? Or is it really Satan. Read the evidence provided in this chapter and decide for yourself. ".Did they stumble so as to fall beyond recovery? Not at all! Rather, because of their transgression, salvation has come to the Gentiles to make Israel envious (Rom. 11:11)." The day will come when Gentile believers will make Israel envious! The results will be almost inexpressible. "[For] if their transgression means riches for the world, and their loss means riches for the Gentiles, how much greater riches will their fullness bring! (Rom. 11:12).".. .Today, there are men and women across the globe who are children of the living God, the spiritual seed of Abraham, joint-heirs with the Messiah, recipients of eternal life, blood-washed, Spirit-filled, consecrated saints as a result of Israel's transgression. How much greater will Israel's fullness bring! At this very moment, a continuous stream of praise ascends to heaven in more than 2500 languages, and angels shout for joy as sinners repent worldwide as a result of Israel's loss. How much greater riches will Israel's fullness bring!" Find out how and what must be done first to bring this about-to do this, you must order the book and read it.